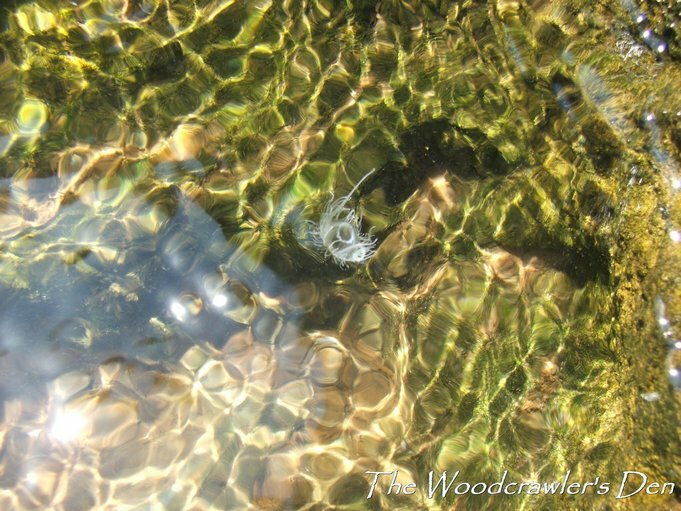 A Woodcrawler's Journal: Do jellyfish sting? When I first saw them I did not realize that I had had the privilege of being granted a rare ‘vision’ of one of nature’s curiosities – the freshwater jelly fish. I did not know that they were such rarities that made an appearance in the same spot only once in many years. These curious creatures may not invite a second look from most of us unless we knew how rare they are. I realized it only because I dug for more information regarding the “danger” they pose to unwitting swimmers. I have always held that jellyfish can give a very painful sting. In the process I found a lot more about these rare creatures. The freshwater "jellyfish" is not a true jellyfish and differ slightly from the true marine jellyfish. Craspedacusta sowerbii (kras-ped-uh-kus-tuh) is the scientific name of this freshwater "jellyfish". One obvious difference is that unlike marine jellyfish, C. sowerbii has a structure call a velum on the ventral surface. This thin, shelf-like membranous structure extends inward from the circular edge (ring canal) of the bell. The manubrium, which ends in a mouth, extends down through a hole in the velum. The velum helps set C. sowerbii apart from the true jellyfish. However, because it looks like a jellyfish, we call it a jellyfish! C. sowerbii belongs to the class Hydrozoa which includes the more common hydra. These jellyfish are about 2 to 3 cm when fully grown. They are translucent, umbrella shaped and have a whorl of string-like tentacles around their circular edge. The tentacles contain hundreds of special cells stinging cells, called cnidocytes. This mechanism is designed for feeding, as the cnidocytes are utilized to paralyze and capture macroinvertebrates and even small fish. However, there is no "hard" evidence that these organisms can penetrate human skin. Freshwater jellyfish eat tiny, microscopic animals called zooplankton that are found suspended throughout the water. Freshwater jellyfish are most often found in calm, freshwater lakes, and reservoirs. They can also be found in recreational fishing and boating areas. The jellyfish prefer standing water and so are generally not seen in fast flowing streams or rivers. They are found floating or swimming just below the surface of the water and is visible to the naked eye. They often surface in large numbers called "blooms". This was in Bhadra reservoir, Lakkavalli, Chikamagalur district, in Karnataka, India. I’ll be glad if anyone tells if they had such a sighting in elsewhere in India. Oops! I stand to be corrected. Apparently the jellies in Bhadra are not the species I mentioned. The expert tells me that it could be Limnocnida indica. Now I'm learning!! Still then, it is quite an experience to see a freshwater jellyfish!